GOLD AND BLACK ILLUSTRATED VOLUME 28, ISSUE 6 31 Anthrop played at least 300. But there are reasons to hope. 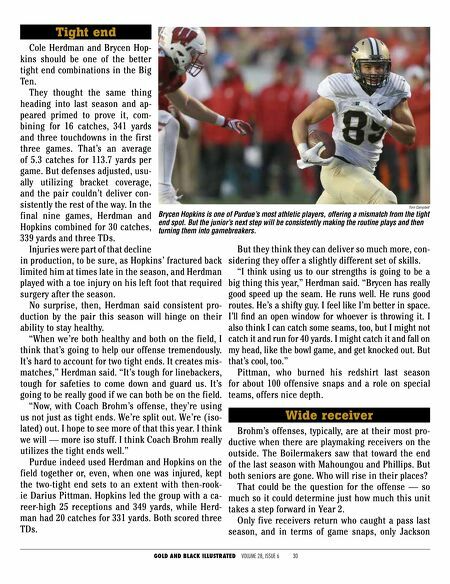 "Our receivers could shock some people," Blough said. "It kind of reminds me of that year with DeAnge- lo (Yancey) and those guys because they were ranked like seventh in the Big Ten West, out of seven. These guys, if we can open it up … there's a lot of guys you trust and then there are home-run hitters, too." Anthrop, who led the team with 47 catches, should be better after a full year of starting. JUCO transfers Terry Wright and Isaac Zico should be more prepared to handle increased loads with that first-year learn- ing curve out of the way. Jared Sparks should be more advanced on how to play the position after having a full offseason at it after making the transition from quarterback. Freshman Rondale Moore could be one of the more explosive, dynamic options, assuming he quickly picks up the complicated offense. And the makeup of the group, too, could help with increased production. "One thing I see about the receiver room now is we have a lot of guys that fit directly into this type of offense," Knox said. "Last year, we had guys — this offense is a lot of quick throws, a lot of running — we have guys with speed and we don't necessarily have huge guys, but these are the type of guys who are quick in and out of their cuts and who can run after they catch the ball. We have a lot more of those receiv- ers now. So I definitely feel like Coach Brohm is going to get more into his element of playcalling with the type of guys we have now. They kind of fit his offense more. Some guys are going to emerge." It'll be interesting to see how Brohm and co-offen- sive coordinator and receivers coach JaMarcus She- phard divvy up snaps and what personnel groupings the offense employs. Anthrop and Moore are both slot receivers, and Wright played there, too, last season before getting work on the outside in the spring. Does that mean Purdue will showcase more true four-receiver looks and play two slots? If that's the case, what about Herdman and Hopkins? Those decisions, certainly, could depend on how the receivers actually perform. Wright may be the team's fastest player, and he flashed an ability to slip tackles and breakaway po- tential at points last season, as well as in the spring. He'll need to continue to build trust with the coach- ing staff in terms of valuing the football — fumbling was an issue last season — and consistently follow- ing assignments. But his explosiveness is a trait Pur- due generally lacks at the position. Zico's ceiling is equally as high, for different rea- sons. 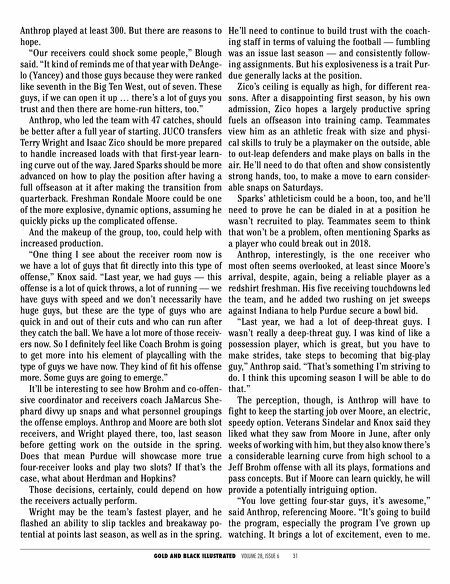 After a disappointing first season, by his own admission, Zico hopes a largely productive spring fuels an offseason into training camp. Teammates view him as an athletic freak with size and physi- cal skills to truly be a playmaker on the outside, able to out-leap defenders and make plays on balls in the air. He'll need to do that often and show consistently strong hands, too, to make a move to earn consider- able snaps on Saturdays. Sparks' athleticism could be a boon, too, and he'll need to prove he can be dialed in at a position he wasn't recruited to play. Teammates seem to think that won't be a problem, often mentioning Sparks as a player who could break out in 2018. Anthrop, interestingly, is the one receiver who most often seems overlooked, at least since Moore's arrival, despite, again, being a reliable player as a redshirt freshman. His five receiving touchdowns led the team, and he added two rushing on jet sweeps against Indiana to help Purdue secure a bowl bid. "Last year, we had a lot of deep-threat guys. I wasn't really a deep-threat guy. I was kind of like a possession player, which is great, but you have to make strides, take steps to becoming that big-play guy," Anthrop said. "That's something I'm striving to do. I think this upcoming season I will be able to do that." The perception, though, is Anthrop will have to fight to keep the starting job over Moore, an electric, speedy option. Veterans Sindelar and Knox said they liked what they saw from Moore in June, after only weeks of working with him, but they also know there's a considerable learning curve from high school to a Jeff Brohm offense with all its plays, formations and pass concepts. But if Moore can learn quickly, he will provide a potentially intriguing option. "You love getting four-star guys, it's awesome," said Anthrop, referencing Moore. "It's going to build the program, especially the program I've grown up watching. It brings a lot of excitement, even to me.